"How dreadfully old I am getting! Sixteen!" 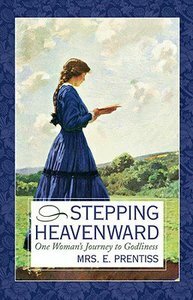 So begins 'Stepping Heavenward' by Elizabeth Prentiss, the journal-like account of a nineteenth century girl who learns, on the path to womanhood, that true happiness can be found in giving oneself for others. "This book is a treasure of both Godly and womanly wisdom told with disarming candor and humility, yet revealing a deep heart's desire to know God," says noted Christian speaker Elisabeth Elliot. "I do not hesitate to recommend it to men, who need to understand the wives they live with, and to any woman who wants to walk with God." Elizabeth Prentiss was a prolific writer, and composed the hymn, More Love to Thee. Customer Reviews For "Stepping Heavenward"
Elizabeth Prentiss writes so genuinely in this fictionally diary of a young woman. I identified with her character so many times. There were many important lessons I could underline it the pages of this book. Katherine, the main character, struggles with many of the same faults I find in myself, yet learns to consistently return to Christ in prayer about them - as I must learn to. I think this book will quickly become a favourite. Stepping Heavenward has been one of the most encouraging books I have ever read. The book was both enjoyable and easy to read but provided deep insight into trusting in God's plan for our lives. There were times in the story that I could really relate to what the author was experiencing and from this I was able to draw encouragement and hope. I highly recommened this book to women of all ages and any men that would like to know the women's mind just that little bit better. A very enjoyable read!